The Dark Encryptor Ransomware is a new malware that encrypts user data with a strong algorithm based on a predefined list of target files. The victims request a fee that is adjusted based on the time of payment. The victims can restore their computers and recover all affected data by following the steps outlined in our complete removal guide. How Does Dark Encryptor Ransomware Infiltrate the System? Dark Encryptor ransomware can be distributed using different attack strategies. One of the most common ones is the sending of spam email messages containing social engineering contents. The aim of the criminals is to infect the victims by manipulating them into thinking that the messages originate from a famous company or a government institution. The Dark Encryptor ransomware can be bundled in both file attachments that are part of the message or linked in the body contents. The hacker behind the malware can also opt to use infected software installers or office documents. Instead of having the Dark Encryptor virus code in themselves they contain scripts that download the payload from a remote server. In some cases such actions cannot be detected by some of the simpler anti-virus products. Downloading software from untrusted download portals or hacker-controlled sites can lead to a Dark Encryptor ransomware infection as well. Browser hijackers that are malicious web browser add-ons that pose as being useful additions. The hackers make them for the most popular applications: Safari, Microsoft Edge, Internet Explorer, Google Chrome and Mozilla Firefox. They redirect the users to a third-party site by changing the default home page, search engine and new tabs page. Security analysists uncovered a new dangerous malware created by a hacker under the alias “carlv” called The Dark Encryptor ransomware. During the assessment the experts did not discover any correlation with any of the famous virus families. No advanced features were detected in the current samples meaning that this could be an initial or test version. Upon infection the Dark Encryptor ransomware starts the encryption process that encrypts system and user data based on a predefined list of target file type extensions. It can be changed according to the targets, however in the most common cases the hackers seek to impact the most widely used files: documents, archives, backups, music, videos, photos and etc. by THE DARK ENCRYPTOR using a military grade encryption algorithm. back, you just need to pay 100 USD in bitcoin. For more informations, please read the text document placed on your Desktop. WARNING: The price will rise to 350 USD if you don’t pay in the next 5 days. Depending on the hacker configuration the Dark Encryptor ransomware may mark the processed files with a custom extension. In most cases the related malware use the same name to label the files, in this case this may be .darkencryptor or .encryptor. 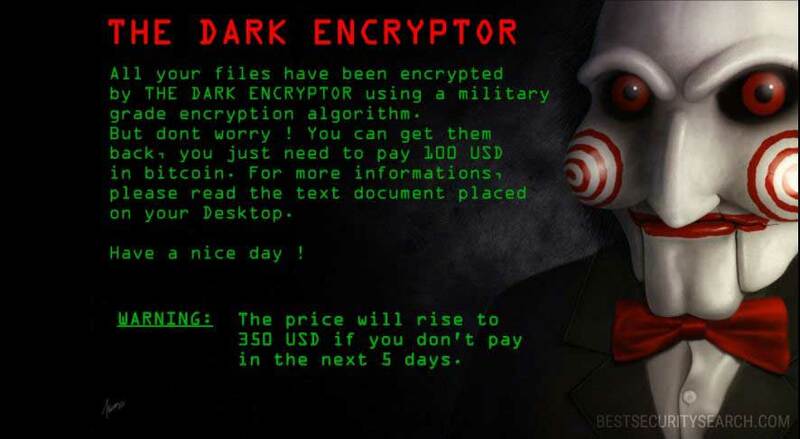 Like other related viruses the Dark Encryptor ransomware creates a ransomware message note that contains instructions on how the victims can py the specified ransomware fee. The hacker behind the file virus has specified that he requests the sum of 100 US Dollars paid in Bitcoins. The digital currency is the preferred payment by computer criminals worldwide as it allows anonymous transactions to take place. They cannot be tracked down to the recipient and this allows the hackers to simply take the money and ignore the compromised files. This is the reason why victims should use a quality anti-spyware solution to restore their computers. After the Dark Encryptor rasnomware has been deleted from the PC a professional-grade data recovery application can be used to recover the encrypted files. WARNING! Manual removal of Dark Encryptor Ransomware requires being familiar with system files and registries. Removing important data accidentally can lead to permanent system damage. If you don’t feel comfortable with manual instructions, download a powerful anti-malware tool that will scan your system for malware and clean it safely for you. WARNING! All files and objects associated with Dark Encryptor Ransomware should be removed from the infected PC before any data recovery attempts. Otherwise the virus may encrypt restored files. Furthermore, a backup of all encrypted files stored on external media is highly recommendable.